, an English poet of considerable merit, was born in London, April 1755, and was descended in a right line from sir Henry Merry, who was knighted by James I. at Whitehall. 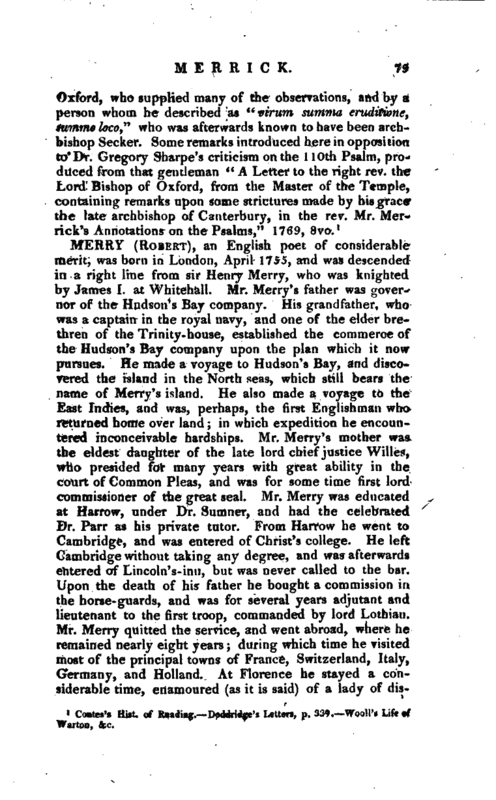 Mr. Merry’s father was governor of the Hudson’s Bay company. His grandfather, who was a captain in the royal navy, and one of the elder brethren of the Trinity-house, established the commerce of the Hudson’s Bay company upon the plan which it now pursues. He made a voyage to Hudson’s Bay, and discovered the island in the North seas, which still bears the name of Merry’s island. He also made a voyage to the East Indies, and was, perhaps, the first Englishman who returned home over land; in which expedition he encountered inconceivable hardships. Mr. Merry’s mother was the eldest daughter of the late lord chief justice Willes, who presided for many years with great ability in the court of Common Pleas, and was for some time first lord commissioner of the great seal. 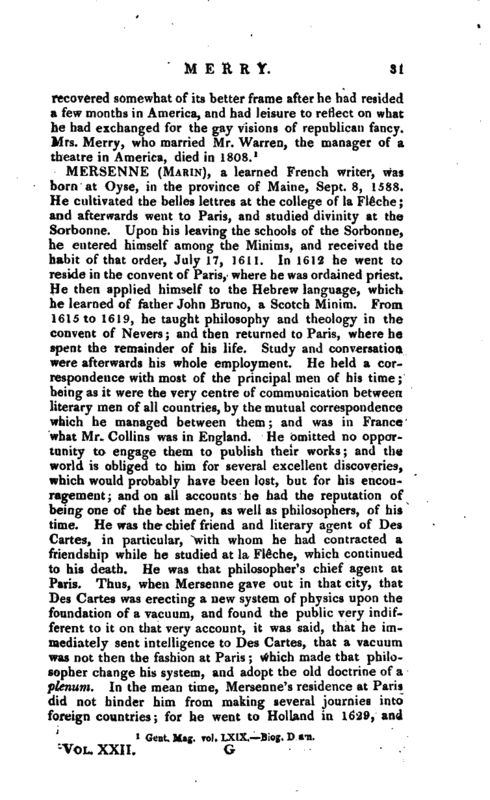 Mr. Merry was educated at Harrow, under Dr. Sumner, and had the celebrated Dr. Parr as his private tutor. From Harrow he went to Cambridge, and was entered of Christ’s college. He left Cambridge without taking any degree, and was afterwards entered of Lincoln’s-inn, but was never called to the bar. Upon the death of his father he bought a commission in the horse-guards, and was for several years adjutant and lieutenant to the first troop, commanded by lord Lothian. Mr. Merry quitted the service, and went abroad, where he remained nearly eight years; during which time he visited most of the principal towns of France, Switzerland, Italy, Germany, and Holland. At Florence he stayed a considerable time, enamoured (as it is said) of a lady of | distinguished rank and beauty. Here he studied the Italian language, encouraged his favourite pursuit, poetry, and was elected a member of the academy Delia Crusca. Here also he was a principal contributor to a collection of poetry, by a few English of both sexes, called “The Florence Miscellany.” The name of the academy he afterwards used as a signature to many poems which appeared in the periodical journals, and the newspapers, and excited so many imitators as to form a sort of temporary school of poets, whose affectations were justly ridiculed by the author of the “Baviad and Maeviad,” and soon despised by the public. Mr. Merry, however, had more of the qualities of a poet than his imitators, although not much more judgment. His taste, originally good, became vitiated by that love of striking novelties which exhausts invention. Of his poems published separately, scarcely one is now remembered or read. 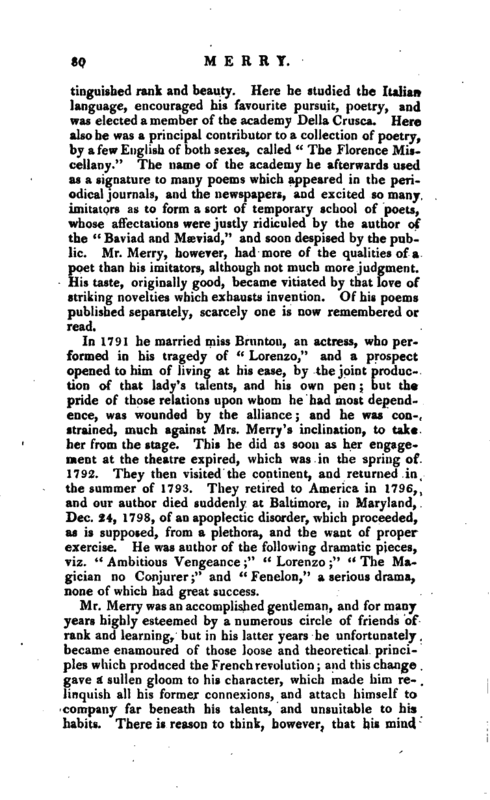 In 1791 he married miss Brunton, an actress, who performed in his tragedy of “Lorenzo,” and a prospect opened to him of living at his ease, by the joint production of that lady’s talents, and his own pen; but the pride of those relations upon whom he had most dependence, was wounded by the alliance; and he was constrained, much against Mrs. Merry’s inclination, to take her from the stage. This he did as soon as her engagement at the theatre expired, which was in the spring of 1792. They then visited the continent, and returned in the % summer of 1793. They retired to America in 1796, and our author died suddenly at Baltimore, in Maryland, Dec. 24, 1798, of an apoplectic disorder, which proceeded, as is supposed, from a plethora, and the want of proper exercise. He was author of the following dramatic pieces, viz. “Ambitious Vengeance;” “Lorenzo;” “The Magician no Conjurer;” and “Fenelon,” a serious drama, none of which had great success.